A rapid electrolyte and fluid replacer for your horse. 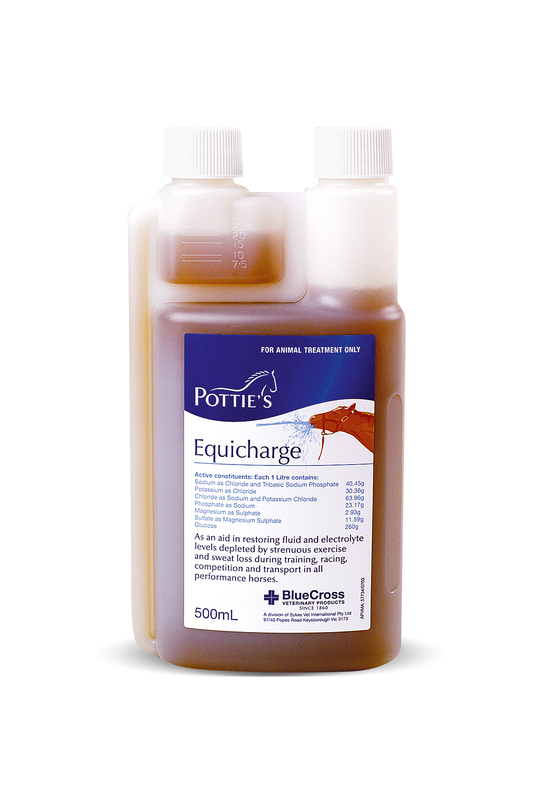 Potties Equicharge can be given by oral syringe over the back of the tongue or diluted with water as a drink. Please note if the Equicharge is given by oral syringe over the back of the tongue, it is required that there is immediate access to clean, fresh water. Dosage Rates (Based on 450-500kg horses) Ponies less than 350kg offer half dose volumes. Severely dehydrated horses- 6-8 litres of made up solution (40mL Equicharge/per litre of water) may be administered by stomach tube as required under the supervision of a veterinarian. Endurance exercise- 60-80mL can be administered by oral syringe over the tongue during a ride or at checkpoints, provided fresh water is available and is offered immediately. Travelling horses/Hot weather or long distances- 40-60mL over the tongue with water provided 30-60 mins before travelling. Repeat every 2-3 hours during travelling, and again on arrival as required.